Today's post is a bit unusual compared to what I usually write on here but I had to share it! One of my favourite banks, many of you probably already know them already, The Vamps released their EP this weekend Can We Dance. They are a boy band made up of four members, the lead singer Bradley Simpson, lead guitar James McVey, their bassist Connor Ball and lastly on drums Tristan Evans, the other three boys also do backing vocals. As I love them so much I pre-orders the album on itunes and then the CDs too, however when the CDs were released I had moved to Bournemouth for University so I had to get my parents to send it here and after 4 days without it, they finally arrived this morning and I have had them for a hour tops and I have already listened to it 12 times. Oopps! 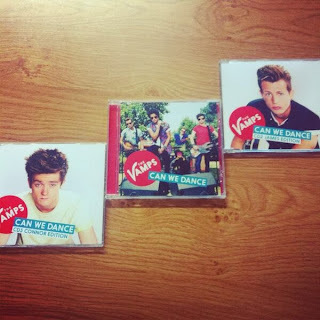 Connor and James have also recorded a version of Can We Dance which I have yet to listen to as I have had quite a lot on with Uni but I will definitely put them on my computer as soon as possible! As I said in my SitC blog post, I did see The Vamps live and their single is just as good as they were live so I really recommend downloading it or buying the CDs to support the boys! Not only do you get Can We Dance but on the CDs you get Wildheart which is another original song of theirs, a cover of Taylor Swift's 22 and a cover of The Killer's Mr Brightside and then downloading the buddle on iTunes gets you Can We Dance, a cover of Busted's Year 3000, a cover of Blondie's Teenage Kicks and lastley a cover of Hanson's MMM Bop. As I said if you haven't heard of any of their music, go and check it out because in my opinion they are amazing! Definitely my band of the month, if not my band of the last few months, hehe! But as this is their EP as well, definitely go and support them in the chart climbing aim! Click here to get it on iTunes and here to buy their CDs. I hope you enjoyed this slightly different blog post today! Let me know if you did and want me to make this a regular thing! Thank you for reading as always and if there is anything that you want to see on here, don't hesitate to ask and I will try my best!